Thank you to everyone who played along this last week, it was a fantastic turn-out! How exciting it is to see Sweet November Stamps getting such a warm reception, and there is still time to get entered into the drawing for all four of these stamps over at the ATS blog... but you gotta hurry or you'll miss out! Ok, now it's on to my card for the day. 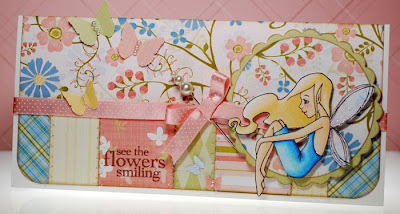 This is my last Sunday as a guest sweetie for the Cupcake Inspiration challenge and I've had so much fun playing along this month... thanks Rachel! We would love to have you play along this week. 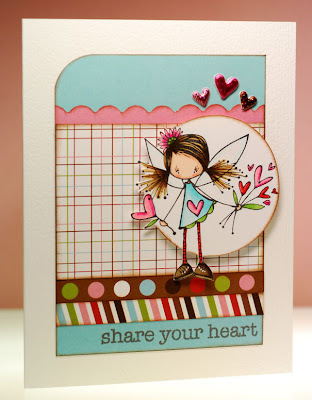 Make sure to add a direct link to your NEW creation via the Mr Linky on Rachel's blog by Saturday Feb. 6th at 9pm MT. If you upload to a public gallery like SCS or PCP make sure to use keyword CIC44 so we can easily find you. 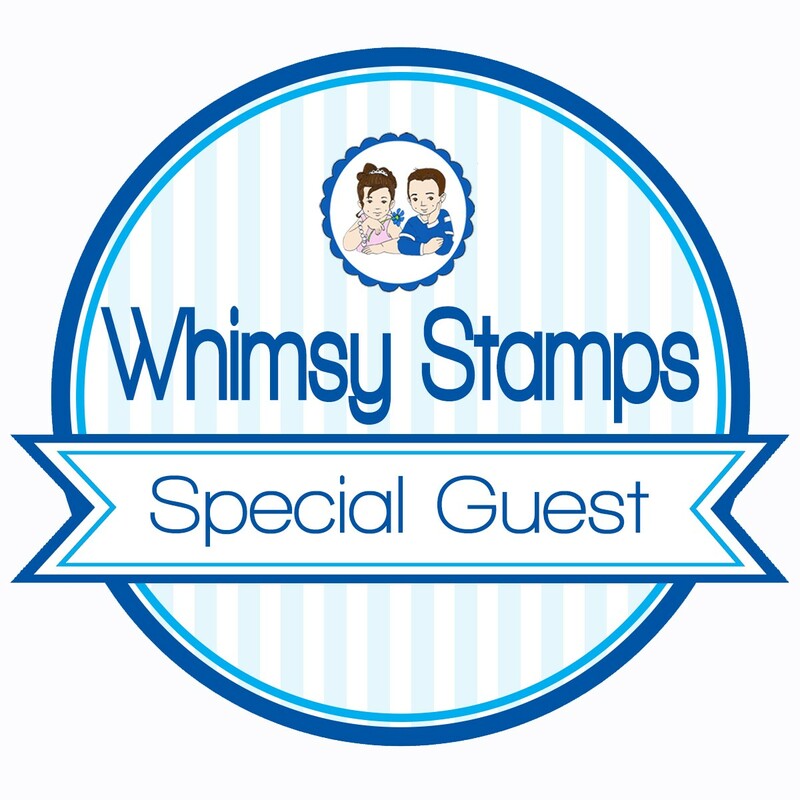 Remember, no cupcake stamps are required! Rachel will post the Top 5 next Sunday! 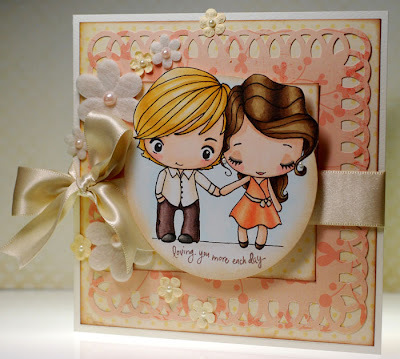 So let's see... what else do I have to share... oh yea, be sure to check out the ATS blog before Sunday night as they are doing previews of all the new February releases, including Sweet November Stamps, with chances to win entire collections. Ya gotta love that! Okey dokey, off to work I go. Hope you all have a wonderful weekend! it's a bird... it's a plane... no it's the AMAZING DUO! I like to call these two Super Ian and Wonder Anya and their set also comes with some fun words like the ones I used here. Not only that but they are another new size of TGF stamp... not quite as small as the girls from the Spa set or Signature set but definitely not as big as a regular Anya or Ian. 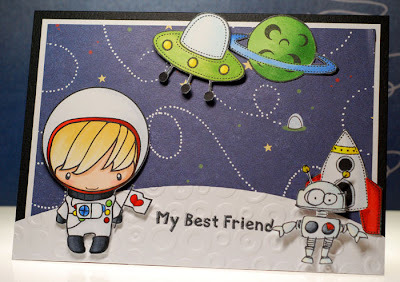 But that doesn't stop these two from making the world a safer place for stampers everywhere LOL! Is it too early to say that? 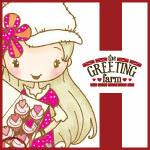 I didn't become a 'friend of the farm' until after this little cutie had already come and gone as a limited edition digital stamp last year and I was always totally bummed that I might never add her to my collection. But after dropping many not-so-subtle hints and much begging and pleading I was thrilled to see Marie grant mine, and I'm sure many others, wish for Easter to be brought back! Give me a woot, woot! 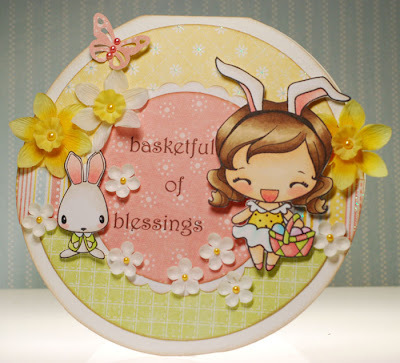 Alrighty, that's it from me today... be sure to head on over to Club Anya to see all the Easter sweetness my fellow CADT have created, it will make you long for spring! I'm gonna be super quick today as I've got a lot to do but I just had to share with you all the return of Soldier Ian! In the meantime you can also check out the Club Anya blog to see more fantastic examples of Soldier Ian in all his honor and glory as he is representing my Wild Card Wednesday challenge today which is to use metal on a card. 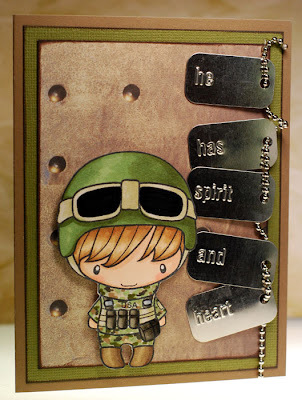 I had these 'old-as-the-hills' poetry dog tags in my stash and I just had to pair them up with Ian, though your cards can use any number of metal embellies that are out there... brads, eyelets, charms, pins, you name it! I can't wait to see what everyone comes up with! Oh happy day my friends! All four candy give-aways will stay open through this Saturday and I will announce the winners on Sunday the 31st. Can you believe it's the last week of January already? I don't know about you but I've got quite the list of things I need to get done before the 1st and right now I'm wishing that a few more days could be tacked onto the end of the month, LOL! But enough of my wishful thinking... time for me to get to the fun stuff for the day! 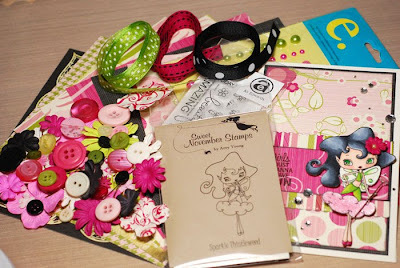 Just post here for a chance to win and if you can link it on your blog that's cool too but not a requirement. The candy will stay open through Saturday the 30th and I will announce all four winners on Sunday the 31st. Today I've got a treat for you that looks good enough to eat, but not so fast! That yummy bunch of grapes is fluttering right off the vine and into the sky... she's the fruit of the month Grape Fairy! Grape is super sweet and occasionally slightly sour, but all in all a true delight. She is the first in a series of fruit fairies that you will be seeing more of in the months ahead so I hope you like this addition to the land of Sweet November. 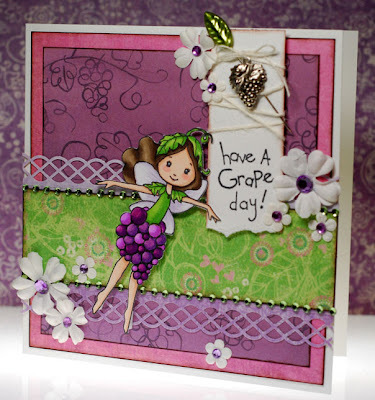 Want to see more delicious projects featuring Grape fairy? 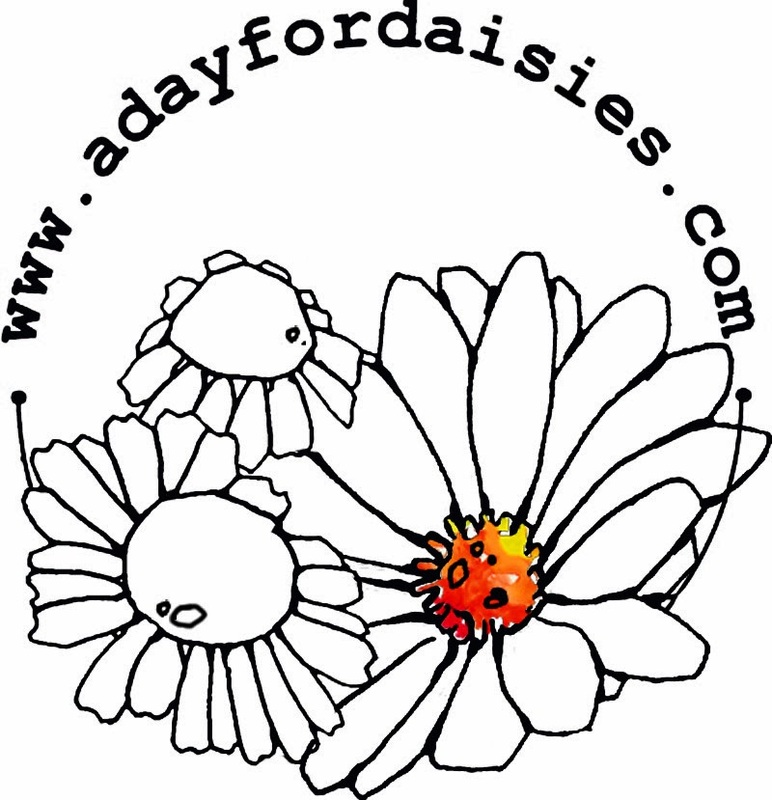 Then be sure to take a look-see at Traci's and Amy's blogs too! Alrighty, time for the candy... wanna see it? 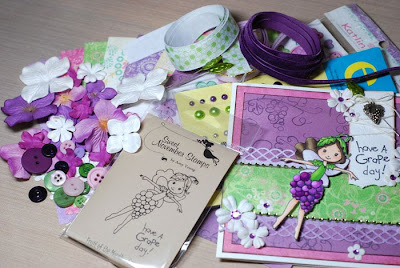 Let's see, what have we got today... one Fruit of the month Grape Fairy rubber stamp, six double sided 6x6 sheets of Crate Paper plus one 6x6 sheet of Karen Foster grape paper, Crate Paper Katlin chipboard buttons, Prima flowers and e.line pearls and gems, Maya road leaf pins, misc buttons and ribbon, four card blanks and envelopes plus my card. The candy will stay open through Saturday the 30th and I will announce all four winners on Sunday the 31st. That's a full day before the stamps even go up for sale at All That Scraps! time for another Cupcake Inspiration challenge! 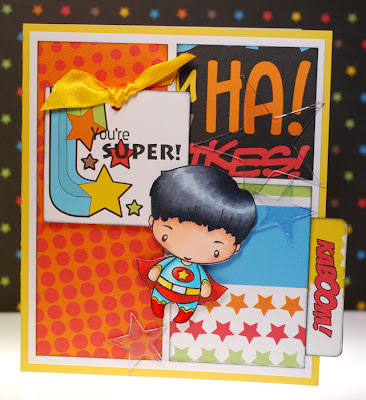 If you've been looking for some motivation to make that perfect boy card just check out the cool inspiration Rachel has found . Don'tcha just love that cutie robot? It was the perfect excuse to pull out this 'build-a-bot' stamp set that I've had for months yet had left totally unloved... tsk, tsk. We would love to have you play along this week! 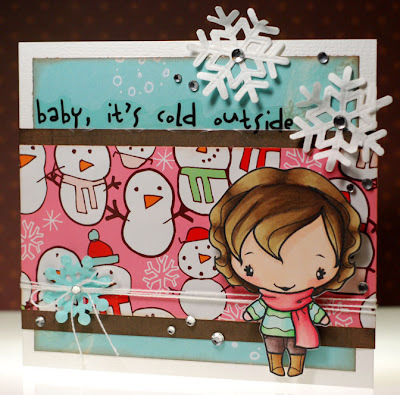 Make sure to add a direct link to your NEW creation via the Mr Linky on Rachel's blog by Saturday, Jan 30th at 9 pm MT. If you upload to a public gallery like SCS or PCP make sure to use keyword CIC43 so we can easily find you. Remember, no cupcake stamps are required. Rachel will post the Top 5 next Sunday! Welcome to another weekend... I can't think of a better way to kick it off than with some brand new Sweet November candy! 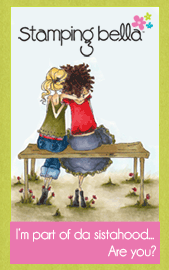 That is why each Darby stamp comes with a friend as well... like a fun little bonus! 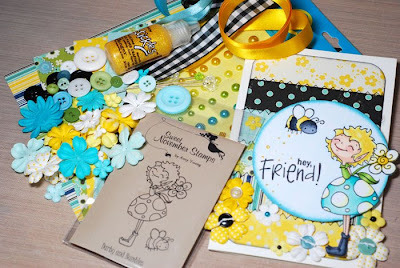 This time around she is joined by Bumbles the bumble bee... isn't he just adorable? 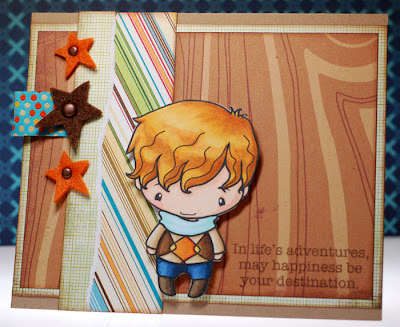 To see a couple more sneak peeks of Darby and Bumbles head on over to Traci's and Amy's blogs! 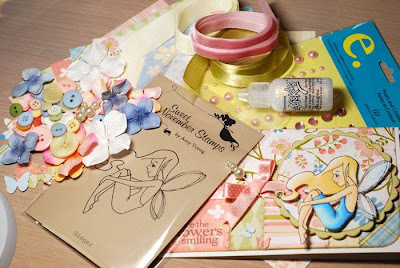 This candy includes one Darby and Bumbles rubber stamp set, six 6x6 sheets of double sided October Afternoon Hometown paper, a bottle of yellow Stickles, Prima flowers and e.line pearls and gems, Making Memories decorative pins, misc. ribbons and buttons, four card blanks, four envelopes... and my card too. The candy will stay open until next Saturday night and I will post winners on Sunday the 31st. 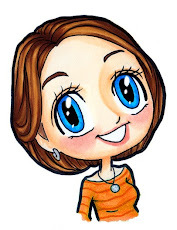 Please give a warm welcome to February's Guest Gal, Amy Gould! 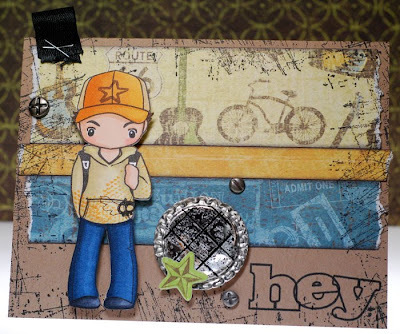 Not only that but she has a creative, outside the box way of using her stamps in cool and unexpected ways... like some pretty amazing jewelry that I just adore, amongst other things! 1. What color do you feel represents your personality and why? I would probably have to say purple as I think there is a little bit of mystery in it, just on the edges of the shadows and I am quite shy until I get to know people. I would rather be behind the scenes than centre stage. 2. 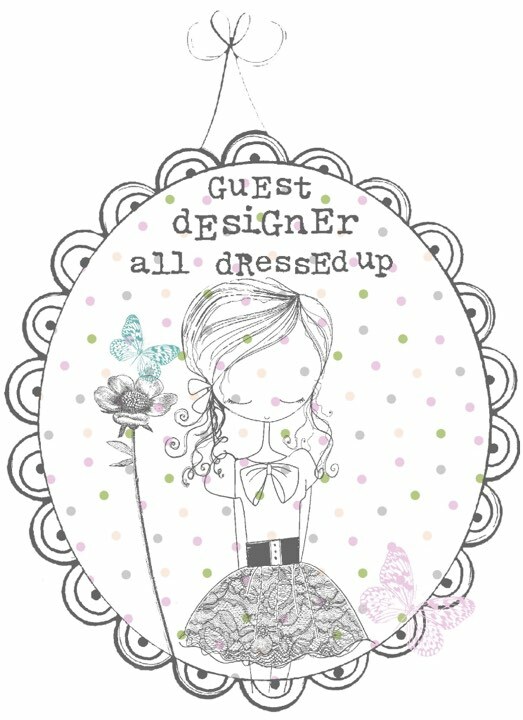 Is your style of dress/home decor similar to your style of card making? It would be if I had the choice but sadly at the moment I am renting so can not change too much. When I was still living at my parents I re did my bedroom a few times and I like quirky little things and art on the walls to inspire me. 3. What one thing always puts you in a good mood? Music. I know that it can also help you cry if you need to but there are so many songs that bring back good memories and I only need to hear the first bar and I want to dance no matter what mood I am in. 4. If you could visit any time in history when would it be? Ooooh good question... I would love to have been around in Victorian times as long as I wasn't in a poor house that is! I love the look of the clothes. 5. If you were a mythical creature ie. fairy, elf, mermaid, troll, etc., what kind would you be and why? I would have to be a fairy. 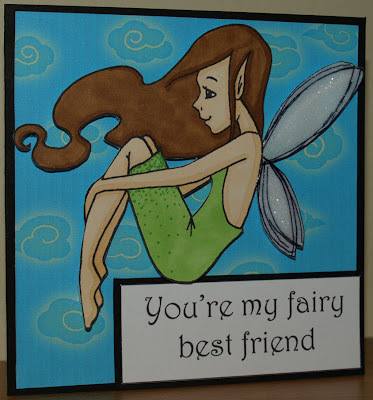 I would love to be able to fly and to be all sparkly (as we all know every fairy sparkles). 6. If you are a fellow Gleek, which character from McKinley High do you most identify with? Now this is a tough one... I think it would have to be Emma Pillsbury. For those of you who don't know, she is a teacher at the school who loves the guy who teaches Glee club. I think Schuester is brilliant just like she does and am a bit quirky (though I hope not to her extreme) and like I said before I am happier in the background than centre stage. Now I would love for you to head on over to Amy's blog and see what she's been working her magic on lately! Today I'm shining the spotlight on a very special gal. She has been a huge influence on me and where I am today and I think she wields Copics like magic wands, her skills are just that awe inspiring. Please give a warm welcome to Traci Porter! Other than a love of color in all these things, probably not. A new episode of Project Runway! Probably Elizabethan England- I'd love to look at the clothing up close! 5. If you were a mythical creature ie. fairy, elf, mermaid, troll etc., what kind would you be and why? Years ago my very best friend and I were having this conversation and she says (and I have to admit she was right) that I would be Dwarven. I am short, round, kind of grumpy a lot, and I love to create things with my hands! I don't know that there is a character that I identify strongly with, but I want to be BFF's with Kurt! 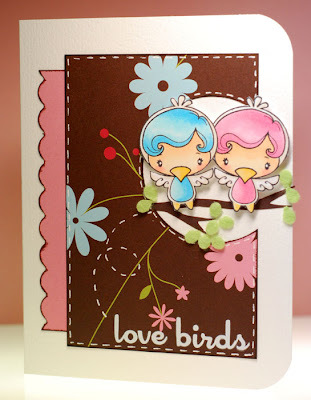 I'm just so pleased with how this card turned out and I have Traci to thank for it! 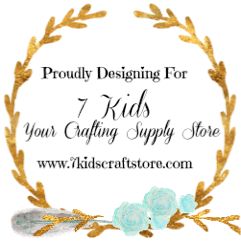 Please be sure to head on over to Traci's blog today and show her some love! Then come back here tomorrow when the spotlight will be shining on my very special February guest gal, Amy Gould! Well hello, hello to all you lovely ladies! 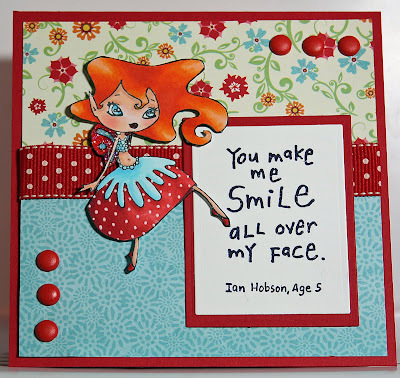 Today over at the Club Anya & Friends blog Lysa has a Wild Card Wednesday challenge that I found to be a fun change up from my usual cards. 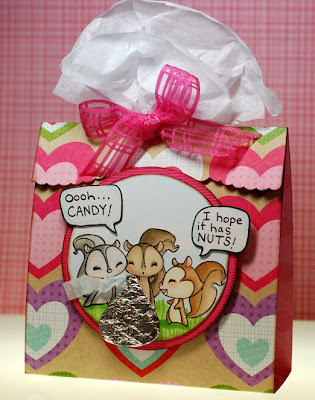 She wants everyone to create some cute Valentine's treat holders! The one I came up with is super simple, just cut a nice weight double sided paper to a 5"x12" strip. Then I scored fold lines at 4 1/2", 6" and 10 1/2" to create a little tent for my bag of candy to rest in. Once I folded everything I just punched a half circle out of the top so the tissue paper could come up through it and secure the candy in place. Now I hope you can make some time in the next couple days to play along too! I really looked at the calendar yesterday and realized that this month is almost over already... holy cow, when did that happen?! 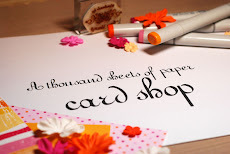 This means that I've only got a couple weeks before my cards are due for Gabby's Miss Anya/My Guy Ian card swap over at Splitcoast Stampers... yikes! So I got down to business and got all four of my Ian cards done, whew! So this is what I came up with for the swap. Now I've got to get my Miss Anya ones done... there are a lot more choices with them so hopefully I can narrow things down and get busy. Wish me luck! Ahh, Monday... back to the old grindstone I guess. It's cold, gray and wet here... I am SO ready for spring to come, I need sunshine! Ok, off to get ready for the day... have a good one! 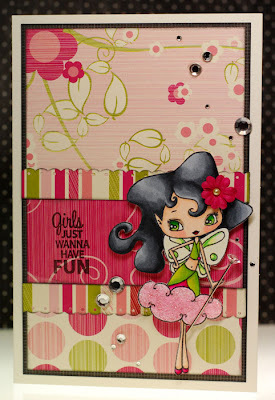 And of course I just had to add my 'go-to' embellishments... pearls and flowers into the mix. This time I had some yummy felt flowers (again from Rachel) as well as my trusty Primas. I even used the teeny tiny pearls again to add little earrings to Maisy... cuteness! and I hope to see you play along this week too! 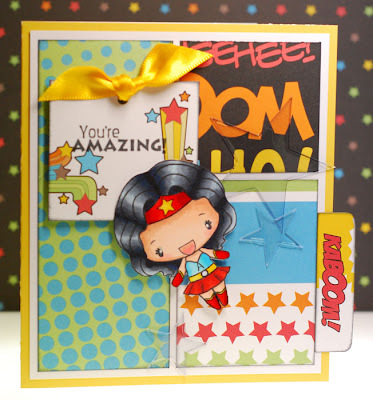 Lots of fun news and a winner!